SEOUL Weekly: SEOUL Subscription Price Drops! Bookshop Staff Needed: Seoul Selection is looking for a marketing assistant to work at our bookstore near Gyeongbokgung Palace. Among the duties you’d be expected to execute are 1) taking care of shop customers, 2) sending out orders received through our online bookshop, and 3) handling orders from overseas university libraries by email and phone. For more information, send an email to hankinseoul@gmail.com. Don’t miss this chance to enjoy SEOUL’s top-quality content for an almost criminaly low cost. For subscription inquiries, send an email to sense@seoulselection.com. With informative articles, gorgeous photographs and interviews with fascinating individuals, SEOUL has been helping international residents discover everything the city has to offer since its launch in 2003. In addition to our print issue, we also offer an easy-to-read digital version, optimized for your tablet device (iOS, Android). * Unfortunately due to shipping costs, the overseas subscription rate will not change. KOCIS is discussing ways to promote the Korean Wave. Director Benson Lee talks about his John Hughes-inspired film. A Korean and a Canadian take to Youtube to promote Jeju’s unique linguistic heritage. Controversy strikes the Busan International Film Festival after shakeup. Korea’s southern coast has a lot going on this time of year. Lots and lots of bamboo in Damyang. A beautiful sunrise at Geojedo’s Haegeumgang Coast. Evening from Busan’s Dalmaji Park. Bright yellow fields in Jejudo. Norwegian indie folk duo Kings of Convenienceâs Erlend Ãye will perform in Korea this March with his new project band The Rainbows. Ãye made his musical debut in 2001 with the Kings of Convenience album âQuiet is the New Loudâ and has won the hearts of many Korean fans. Because of the bandâs big fan base in Korea, Ãye has visited Korea almost every year since his first visit in 2010. For his experimental second solo album âLegao,â Ãye collaborated with the Icelandic reggae band Hjalmar to create a lively collection of tracks. GETTING THERE: Gwangnaru Station ê´ëë£¨ì­ (Line 5), Exit 2. Cross the road, turn left and walk five minutes. The hall is located behind the youth center. Over the course of the past decade, the South Korean publicâs engagement with the issue of unification and North Korean human rights issues has become increasingly polarized. NGOs and civic groupsâpopulated largely by committed human rights activists and North Korean defectorsâhave begun to use aesthetically unconventional means of cultivating public interest in North Korea. Their arsenal includes, but is not limited to, transmitting shortwave radio broadcasts about the outside world into the North and sending giant balloons filled with incendiary political leaflets and Choco Pies across the DMZ. In spite of their meticulously choreographed efforts to draw the publicâs gaze, the South Korean news media still bristles with images of military hardware, marching soldiers, and flaming missiles, all underscoring one important point: North Korea is a threat to global security. Northeast Asian regional security in the 21st century will be shaped in no small part by the bilateral relationship between North and South Korea. While the jawdropping speed of change and the internationalization of South Korean society has built a culture of opportunity and progress, it has also brought many changes to patterns of civic engagement in public spheres. The rift between activistsâ efforts to humanize North Korea and the international communityâs perception of North Korea as a relentless producer of nuclear warheads is jarring. My project has been an exciting opportunity to capture evolving views at a critical juncture in modern Korean history, in the wake of the North Korean ascendancy. DATE: Mar. 20, 7PM. RSVP by Mar. 18. Stop by the Seoul Trade Exhibition & Convention (SETEC) on March 12-15 to take part in the third Korean Temple Food Festival. Hosted by the Cultural Corps of Korean Buddhism, the festival will feature delicacies made by 11 temples especially recognized for their food offerings, as well as by monks renowned for their culinary skills. There will be a wide range of exhibits, lectures, tastings and hands-on programs where visitors can experience the unique taste and spirit of Buddhist cuisine as it has been handed down through the ages. For international participants, there will be specially prepared Buddhist meals, motion games based on Buddhist meals and webtoons about temple food. The Sixteen is a choir and period-instrument orchestra founded by English conductor Harry Christophers. The ensemble performs early classical music including English polyphony, Baroque music and other pieces from the Renaissance. Starting as a group of friends who got together to perform at a small concert more than 30 years ago, the ensemble has since won many international awards including Franceâs Grand Prix du Disque and Britainâs Gramophone Award. For their first performance in Korea, the group will sing the tunes of âMiserereâ written by Italian composer Gregorio Allegri. GETTING THERE: GS Tower B1 floor is directly connected to Yeoksam Station ì­ì¼ì­ (Line 2), Exit 7. Take the LG Arts Center elevator from there. 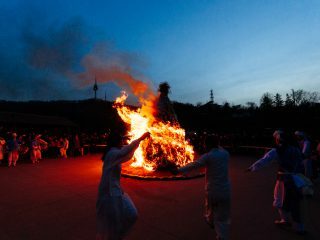 The burning of the daljip on Jeongwol Daeboreum, Namsangol Hanok Village. Photo by Robert Koehler. http://magazine.seoulselection.com/wp-content/uploads/2018/01/Seoul-logo.png 0 0 rjkoehler http://magazine.seoulselection.com/wp-content/uploads/2018/01/Seoul-logo.png rjkoehler2015-03-13 01:05:332015-03-13 10:09:25SEOUL Weekly: SEOUL Subscription Price Drops!